Toshiba's Cell TV has finally arrived and with it comes a whole host of features never seen in a television before. With most TVs launching in 2010 making use of the interweb, and Project Canvas all poised to flood living rooms with internet video, it's a fair bet that we will all be watching web-based content on our big-screen TVs soon. The problem is picture quality. Standard streams of video on the internet are shoddy at best and when blown up to 40-inches and above pixels that look small on your computer screen will be football sized on your telly. 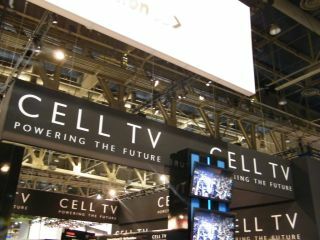 Toshiba knows this and that is why it has put an internet TV enhancer into its Cell TV. Using Net Super Resolution, Toshiba up-converts low-resolution web content for big-screen display, courtesy of its proprietary compression noise-canceling tech. Essentially giving your web content a decent clean-up so that it looks presentable when displayed on screen, a feature which is more than welcomed considering Cell TV will allow you to access myriad internet TV channels. Having a 3D TV is all very well but the distinct lack of 3D content for the home means that early adopters will be left wanting in 2010. To satiate your three-dimensional needs, Toshiba has introduced a 2D to 3D real-time converter into Cell TV, which makes use of the TV's powerful Cell chip. Toshiba is calling the technology Tri-Vector, and it uses proprietary software to analyse the 2D frames and figure out the depth of field in each frame. Once this is done, the TV creates a separate image for the left eye and right. This then gives off a 3D effect, which you can view through active shutter glasses. In the demo we say, the technology really does work, and it can also be attributed to photographs – so that old image you have of Pamela Anderson looking lovely in her hey-day can now be brought to life! 3D TV is all the rage this year but Toshiba's 3D technology is something to be admired. Due to the sheer amount of hertz it has processing the images, the 3D is brighter and more immersive than we have seen before. Although you only need 60Hz piped to each eye to watch 3D, Toshiba has upped this to 120Hz for each eye. Toshiba is calling its 3D tech True 3D and the television accepts multiple 3D input formats, including MPEG4-MVC, RealD, and the like. Couple this with the 2D to 3D conversion and it seems that Toshiba has all the three dimensional bases covered. While you sit back, relax and bathe in the beauty of you 1080p Full HD TV sets just remember that all you are doing is training your peepers for the awesomeness that is 4K resolution. Not twice but more than four-times the resolution of 1080p (4096×2160 to be precise), 4K in the home will blow your mind. Not only does it make 3D crisper, it will give movie studios the chance to truly show off their movies in the future, as 4K is equivalent to the quality found in 35mm film and is what is behind the brilliant images that the RED Camera creates. LED technology has got the television industry in a bit of a tiz at the moment. The benefits of the technology are for all to – see- brighter images but using less power – but it's problem is that it is confusing consumers who think it is another panel option, like LCD and plasma.